I have been a bit MIA with my wishlist posts, 2 weeks and 2 no shows I do apologise. Life somewhat gets in the way of the old bloggy blog especially when there's full time job and a social life to contend with. But here I am, back and full of promise that I will keep up my weekly shizz and won't forget again. 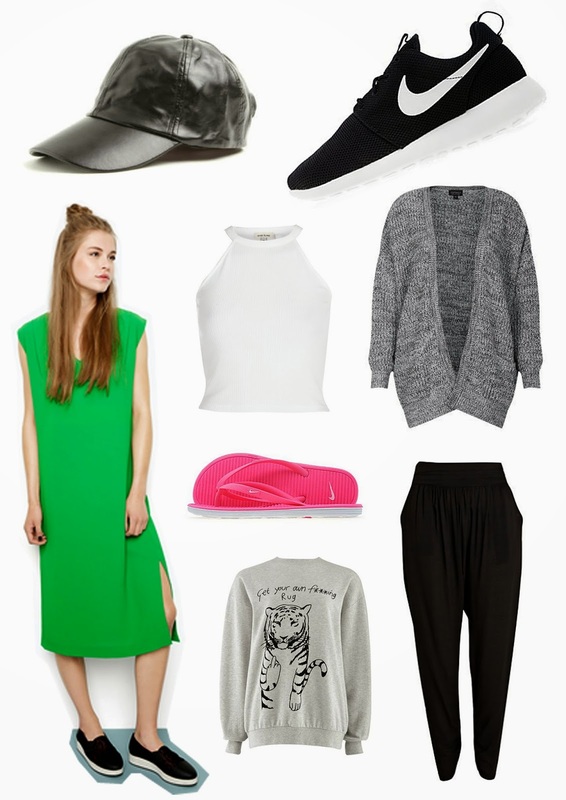 This weeks lust list has a uber relaxed vibe going on as right now it is totally OK to be seen out in loose, over sized casual clobber and to style everything with a pair of trainers. This is amazing news for me as there's nothing I love to do more than chill in joggers and whizz up the shops in an oversized cardi, little vests and baggy harems. Happy Wednesday Ya'll, see you in my next post. I love the colour of the green dress, so lovely! Feelin' your pain...so difficult to keep the old blogging schedule going!! Cool Post! I like you style!